You know we bake. You probably know baking is not all that great in the summer heat. Especially when we had 90°F days with a heat index of 100°F. Turning on the oven is basically irresponsible in such heat waves, you don’t want to be heating up your house when trying to cool it down. So, we were idle. Our oven empty save for a few forgotten pans. Finally though, that heat broke. So it is all ovens go. Turn that heat up, to fill our fresh-bread starved mouths. This time the challah recipe made for 40 years in our house underwent an update. Turns out the challah I’ve made for most of my life wasn’t exactly kosher. So while I’ve always loved it, a couple tweaks make it easier to work with and also check that kosher box. First, we’re changing the honey to straight up granulated sugar. The sugar instead of honey allows the dough to rise faster and more evenly. It also produces a smoother dough. Which makes more elaborate shapes easier to produce. Swapping sugar for the honey also keeps the challah bread from getting too brown when baking. The honey causes the challah to deeply brown and I prefer a more golden loaf. Second, we’ve changed the oil to olive oil. While this isn’t a huge change, to me it feels more authentic. Olive oil has been around and used for centuries while canola oil or vegetable oil is a fairly new invention. This doesn’t really change the flavor profile, but like I said it feels more authentic. 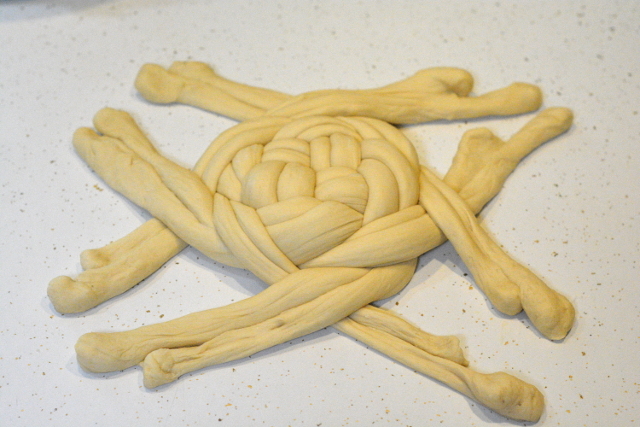 These tweaks allow for the rose braid shape. The rose braid looks extremely intricate and fine but is even easier to execute than a 6 strand braid. Do not panic. Photos will follow that you should be able to replicate with confidence. 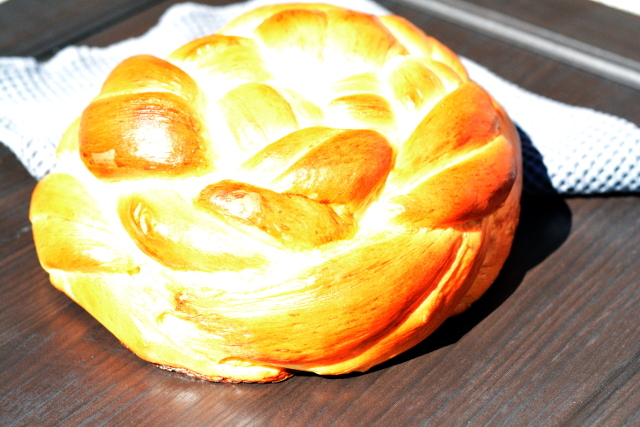 A more traditional challah loaf featuring a rose braid. This creates an elegant round that is quite easy to braid. Dissolve yeast and 1 tablespoon sugar in 1/3 cup warm water, let sit 5 minutes until frothy. In the large bowl of a mixer, combine the 1 cup warm water and sugar. 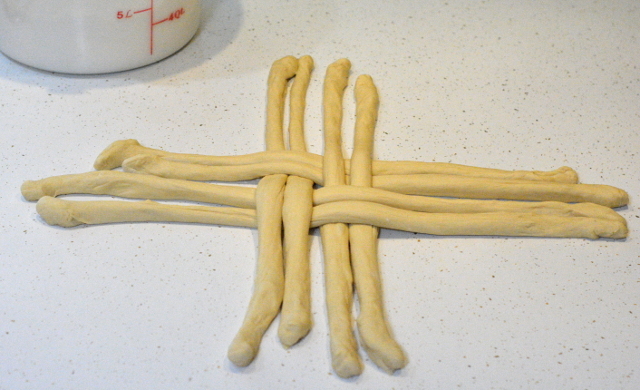 Add oil, salt and yeast mixture. Beat in 3 eggs. 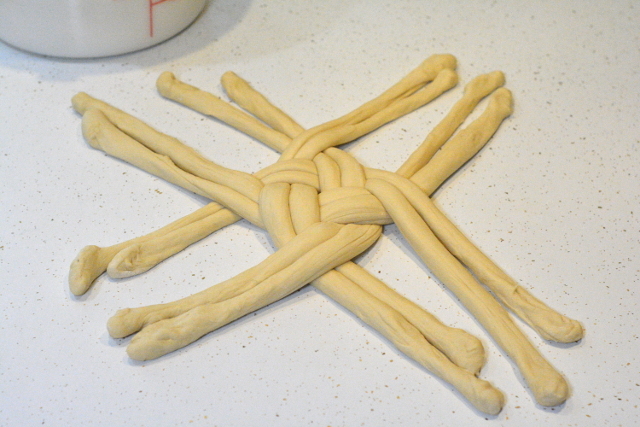 With a whisk, stir in 3 cups flour and then add the rest 1/2 cup at a time to form a stiff, sticky dough. Turn out onto a floured countertop and knead for 5 minutes, adding flour as needed to keep dough from sticking. You’ll know when it's done, dough will be elastic, smooth and hardly sticky. Place in an oiled bowl and set aside to rise, until doubled. Punch down dough and separate into 8 equal sections. The rose braid is similar to a basket weave with over and under tucks. Split your dough into 8 even sections. Each section rolled into the same length roughly 18 to 24 inches and approximately 1/2 inch to 3/4 inch thick. 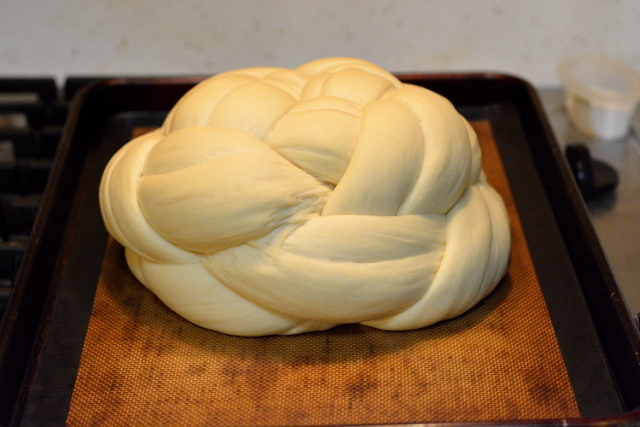 The longer the strands the taller and more intricate your loaf will be after braiding. The loaf you see is crossed 5 to 6 times before being tucked. I know you want this to be more precise but the size of the dough will depend upon your rise and each batch is different even with the same ingredients. So with your 8 equal strands, you will create 4 pairs. So each section is a double strand. These will remain together. Think of this as making a circular basketweave. You’re basically continuing the weave, but in a circular pattern instead of adding more strands to make the weave bigger. Lay 2 of your pairs horizontally while crossing them with the remaining 2 pairs vertically. Now continue to going around clockwise, crossing the left strand over the right strand. So each strand continues moving in the same direction. Alternating being underneath to on top. As you can see in the above photo the bottom pairs are all moving counterclockwise, while the top pairs are moving clockwise. 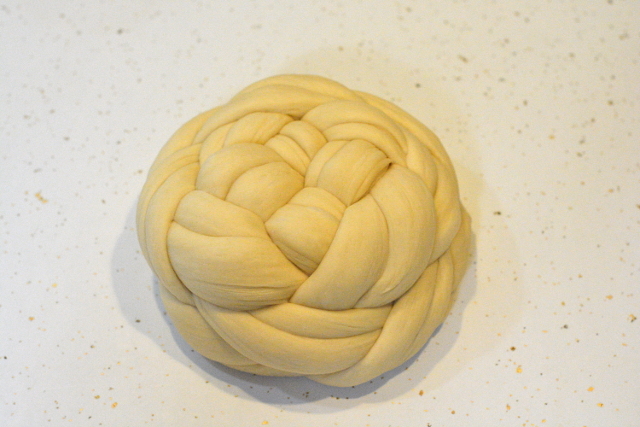 Continue to braid in this fashion going clockwise around the loaf, until your strands get too short to braid. At this point, cross your strands and pull them taut underneath the loaf. Place your loaf on a baking sheet covered with parchment and allow to rise until double in size before baking.